This dreams token is a mark of belief and inspiration to help your friends achieve their dreams. Whatever your friends' wishes, our 'Reach for the Stars' dream token will help remind them of their goals and help them to achieve these aims in their particular actions or events. As Tennessee Williams said: "Luck is believing you are lucky" - and it has been proved that there is power in a thought made concrete by a charm - being a constant reminder of purpose and desire. In other words, it is the thought, the belief, that counts. So whatever your friends and loved-ones beliefs, this token will help remind them of their goals and inspire them to reach for the stars as they go about their daily lives. Each one is made from lead-free, cadmium-free pewter that is certified safe. 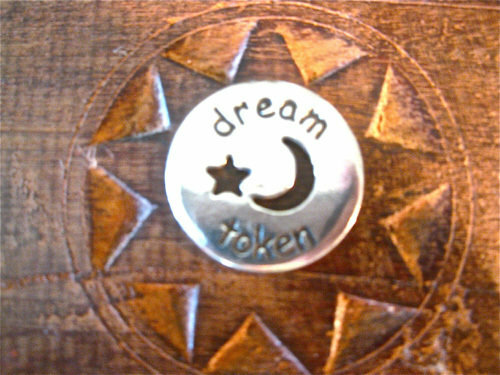 On the front of the token it says "dream token" and on the reverse, "reach for the stars"
. . a wonderful gift to encourage a friend or loved-one. (Could be a small commemoration gift for a Graduation too.) Comes gift-wrapped, like all our presents - and we can print a personal message on your behalf.